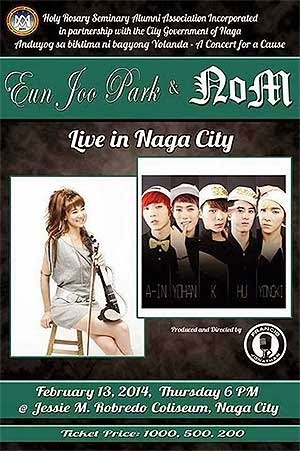 Two Korean acts will perform at a benefit concert next week in the City of Naga. Violinist and actress Eun Joon Park as well as pop group NOM will come together in "Anduyog sa biktima ni bagyong Yolanda - A Concert for a Cause," a fundraiser for the victims of last year's supertyphoon. The concert will take place at 6 PM on February 13 at the Jesse M. Robredo Coliseum. This event is spearheaded by the Holy Rosary Minor Seminary Alumni Association Incorporated, in partnership with the City Government of Naga. Ticket prices are at P1,000, P500, and P200. To reserve tickets, please contact NOM PH / 0926-1804328 or 0928-3943015 or fill out this online form.